Public transportation to the center or on foot. The Design Center at Europaplatz 1, 4020 Linz, is directly linked to the public transport system. The nearest bus stops are about 200 metres away. The distance to the main train station is about 2 kilometres. 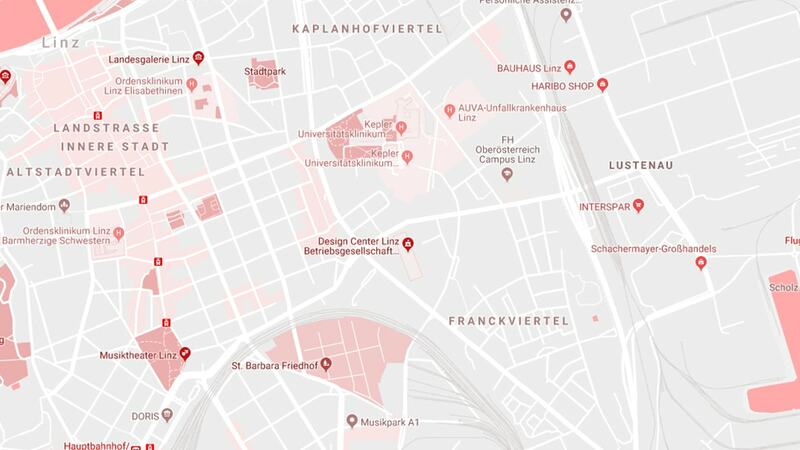 You can reach the downtown area (Landstraße, main square…) with the above mentioned buses (three stations from the Europaplatz to the Goethekreuzung), and further taking lines 1, 2 and 3 from the Goethekreuzung. The Linz Airport is located in Hörsching, 14 kilometres from the centre. Airport shuttle Nr. 601 connects the downtown Linz with the airport. Travel time: 19 minutes. The OEBB are intending to improve the accessibility of the Vienna-Schwechat Airport for travellers. Therefore, the OEBB are going to establish a new track (2.1 kilometres) within the next two and a half years. This route will then connect the Ostbahn with the airport express train S7. This way the Vienna Westbahnhof will be directly connected with the airport. Through this extension and the simultaneous expansion of the Westbahn route, the travel time from the Vienna Airport to the main train station in Linz will be reduced from the current two and a half hours to 75 minutes.